Thanks to my cousin and Sean for both pointing me to Yaktracks. After taking three tumbles in one dog walk, I knew I had to do something to try to avoid breaking a hip before I was eligible to join AARP. Yaktracks are like the poor man's crampons. 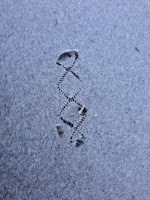 No actual spikes, but a chain-like material that stretches over the bottom of your shoe or boot to make it more secure for walking on snow or ice. So far so good. I've remained vertical since acquiring them. But to be fair, I remained vertical since falling those three times. On my inaugural walk, I was asked by two neighbors, both walking their animules, what I had on my feet - I told and showed them. I sent them the link once I got home and it looks like the company will get two more sales. 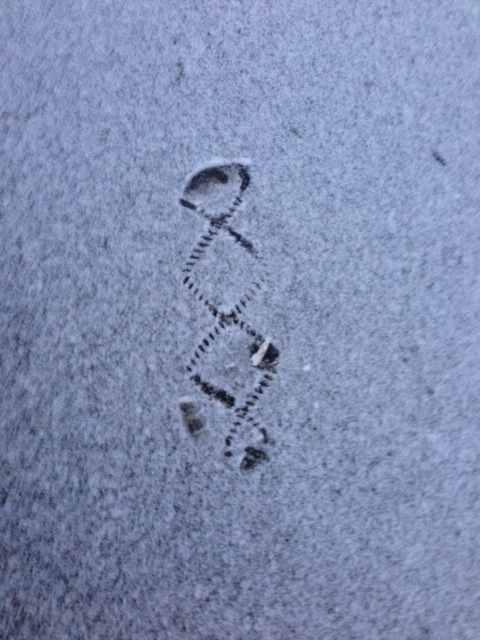 David is right - the "footprint" does look like a strand of DNA. The funny thing was, between the time of Sean and him suggesting these and to the time of buying, I saw mystery tracks in the snow while walking Petey and figured someone else in the 'hood had these. I'm not a trailblazer. Perhaps it is too early to give these my ringing endorsement, but I suppose I can assess over the next few weeks. I'll report back. an argyle sock pattern too. interesting "footyprint", as yosemite sam might say. cause I tell a joke or two"
I've had a pair for two years and love them. They really help. Anything that helps is huge. I took a faceplant Saturday and thought I dislocated my shoulder, not to mention looking like a complete fucktard on the trail. Can we say that if you never fall while wearing them that they work? Glad you got them and more importantly are using them. Does Petey need them? Yaktraks are awesome! I have a set. I wear them with my Chucks during the winter. You know, because Chucks have so much tread. Sadly I wasn't wearing them today when I slipped and fell and landed on a rock on my spine/hip. Ugh. WTF?? I also mentioned Yak Trax! I have bought pairs for both parents.